← Natural Silver Polish with Baking Soda and Aluminum Foil Review – Does it Work? Using Baking Soda and Hydrogen Peroxide To Easily Clean Baking Sheets Review – Does it Work? 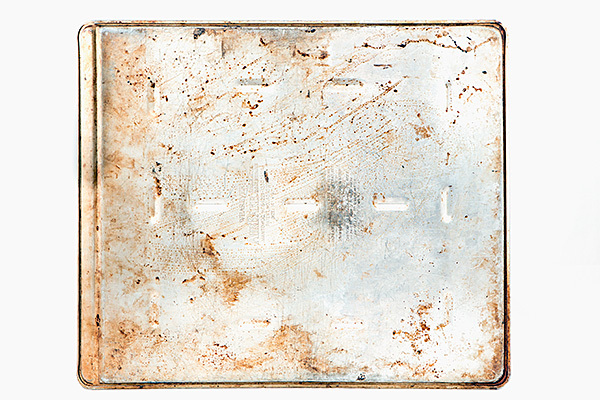 Over time, most any well-used metal baking sheets tend to develop a patina of copper colored gunk. Some consider this a good seasoning that develops over time, or a record of your kitchen history. Others feel that it is a sign that you are not cleaning your pans well enough. 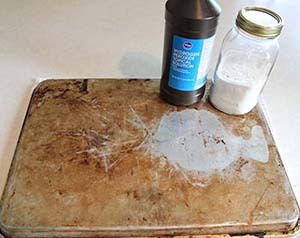 A quick web (or Pinterest) search suggests that a soak in hydrogen peroxide plus baking soda will eliminate the bakeware staining with virtually no effort. 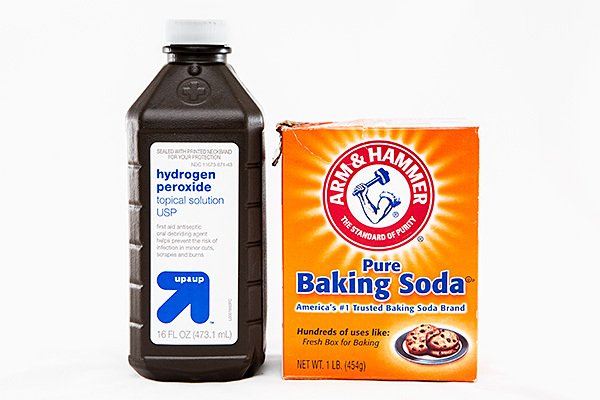 Can hydrogen peroxide and baking soda easily remove the baked on stains? I came across this nifty (and practically magical) trick on Pinterest. The pin linked to one of my favorite DIY sites One Good Thing By Jillee. It seems that Jillee had sprinkled baking soda and peroxide on her yucky baking sheets, waited an hour or two, and then easily wiped away the grime. Look at how promising this photo is! This is what I was looking forward to. Photo by Jillee. Yes, the right half is slightly cleaner, but I expected an obvious improvement! A Green Idea Fail! How disappointing!! I don’t know what I did wrong. Perhaps I needed more of all the good stuff? Perhaps my tray just wasn’t dirty enough? Or maybe this really takes a little more elbow grease than just a magically quick wipe down? I’m not sure, but I will certainly be adding to the list of green ideas to try again one day (ala Mythbusters Revisited ). UPDATE: My husband used some steel wool and his strong muscles to make these sheets as shiny as a mirror! No baking soda or peroxide required! Have you ever tried this trick to clean your baking sheets? Did it work for you? Or do you even care if your trays looks like this? This entry was posted in Baking Soda to the Rescue, Cleaning and tagged baking soda, better for the earth, better for you, cleaning, Green Idea Fail, hydrogen peroxide, saves money. Bookmark the permalink. 54 Responses to Using Baking Soda and Hydrogen Peroxide To Easily Clean Baking Sheets Review – Does it Work? I found your blog through Better Mom Monday! I found your link-up intriguing so I clicked on over to say hi! Thanks for sharing your “fail”. I’ve used vinegar and baking soda since it’s an item I can buy cheaply, but not peroxide. Very interesting. Just goes to show that lots of stuff pinned or online are NOT true. What may increase the cleaning procedure is if you heat the vinegar for 45 seconds before applying to the pot. I tried this with no results as well. The thing that worked for me was soaking them in ammonia for a few hours covered with plastic wrap to reduce the smell. I then took some steel wool and they cleaned up beautifully. It is a harsh chemical method, but I haven’t found a gentle way that works. Hmmmm…. I think I’d pick the brown trays over ammonia soaking. i’ve heard that you actually don’t need to have ammonia cover the surface. You can place an item in a plastic bag with some ammonia (in a dish) for 24 hours — tightly sealed — and the “ick” will wipe off easily. No, ammonia isn’t pleasant to smell but it does break down quickly in the environment. I was also inspired by this idea. I was equally disappointed. I even scrubbed the dickens outta those pans! I will try the ammonia method when my courage is peaked and I am again disgusted by my pans, lol! My best idea to not think about the pans is to use parchment paper when I use them. Lazy way to make me feel better! thanks for letting me know I’m not the only one! How sad that it didn’t work! I just started using parchment paper for everything. I know, it is the lazy way out but I just got lazy! Thanks for sharing on Natural Living Monday! I am excited to see what you have to share this week. Okay folks, I understand the need to save, recycle, go green, etc. I love all the ideas shared on these blogs; I use a lot of them 🙂 In this case, my best advice would be to replace the pans with new ones – I just purchased a sun oven and it came with new baking pans. I thought it would be nice to have a new cookie sheet – inexpensive and oh so nice. The old one will be recycled under my worm compost bin to catch drippings. Use the money you spend on cleaning supplies trying to restore old worn out items and treat yourself to something new. I agree. Just save the money you would use for the cleaners and buy new ones. Do this ~ put your baking pan inside a plastic bag with a small container, or rag soaked in ammonia. Close tightly and let it sit all night. The next morning you can easily scrub off (using a stainless or copper scrubber) the good on your pans. I did this trick on the burner grates in my gas stove. This worked PERFECT! It really was like magic! I used an old toothbrush to “scrub” any cracks/crevices. Even there, scrubbing was barely needed. I used to use TONS of elbow grease to scrub those things clean with Soft Scrub. Now, I will always use the ammonia trick (only in summer so I can put it outdoors overnight). When I did use the Soft Scrub, some of the spots still did not come off but with ammonia soak overnight, ALL spots came off! I was amazed!! I used an old 9×13 pan as my burner grate thins would not fit into a large zip lock bag. Then I covered it with plastic wrap for the over night soak (the one I had heard required a 1/4 cup of the ammonia). It kind of wrecked my 9×13 pan so I only use that one for my burner soak. I could put 2 of the burner grates in the pan at one time. So, it took 2 full days to get all 4 burners done. That stinks! Thanks for the follow-up! For some reason, I recall my mom cleaning porcelain with citric acid…. but she also used cream of tartar for things that weren’t as stained. I tried it this morning and found that it did work. All I could remember was baking soda and peroxide, not the instructions. So I made a thick paste of the two and spread it on the cookie sheet. (Should have taken before/after photos) I walked away. Had to scrub a bit, but it all came off. I was pleased with the results. I just tried it and it didn’t seem to be working. I made a search for how to do it correctly and found this. Too bad that I didn’t search first. I guess I wasted my time. Next time I’ll try the lemon juice and vinegar instead. This green cleaner was all the talk at my garage sale yesterday where I had ALL my baking pans at 50 cents each, however no one had ever tried it. Mine did not sell, they will go to charity and I will buy new with my sale $$… after 20+ years of use I think ‘I’ deserve it, and it is always nice to know that someone may benefit from my purge! I tried it, too. No such luck. A friend sent me here to see that I was not alone! I took pictures for my FB site; I, too, worried that I had failed to follow some invisible instruction. I started using parchment paper a few years back, so I haven’t been as worried about the brown stains on my pans, but whenever I see a recipe for success posted on my FB site, and it costs me nothing but time to try, well, I’ll try nearly anything once! Thanks, Victoria, for this site, and thanks, ladies (and any gentlemen I may have missed), for sharing your experiences so I don’t feel such the dolt! Regards!! Lack of working as well. Baking soda and vinegar works to a degree but not enough to really notice. Try the baking soda and vinegar two or three times. I really like this combo. Will try the cream of tartar, though and see if that is faster. Forgot to say that on the pot I didn’t let it sit, just used the paste straight on the sponge and it basically wiped off. Heat is the missing ingredient. It may be tough to do this on something that doesn’t itself contain water. I had a big pot with half a centimeter of burnt drippings from steamed sweet potato (never let your water boil away when steaming). I poured in a pint of hydrogen peroxide, sprinkled half a handful of baking soda in it, and turned on the heat. I just let it simmer for about ten minutes, stirring every minute or two, letting the spoon rub/scrape on the bottom of the pot (no scrubbing or elbow grease required). I had to do it a second time, but after that all that remains is some tiny black specks on the bottom. I’ll have to do it one more time when I get more peroxide. Having read all of these comments I decided to try a remedy of my own. I used washing soda (sodium carbonate), dishwashing detergent (I used Sunlight), and very hot, but not boiling, water. I soaked the muffin tins with baked-on grease in this mixture for about 2 hours. Then the brown grease was easy to remove with a scouring pad. Now my pans are nice and clean again. Buying new pans is not an option for me, as mine are quite old and are a much smaller size than modern muffin pans. That size is no longer available in North America. Thank you, Robert. My pans belonged to my grandmother, and they are now close to 100 years old, so definitely not non-stick. I also bought an old muffin tin at the thrift store to try out my remedy, just in case it damaged the pan. And yes, don’t use abrasive cleaners on non-stick pans! While searching for a way to protect my stove range hood (the underside), I was dreading the task of cleaning. I wanted a suggestion to never have to go through what I was about to face. Then I discovered the baking soda/hydrogen peroxide paste. I tried it, just now. WOW!!! The grease came off, with very little elbow grease. Thank You!!! It took little time, & looks great!!! I think it must depend on what kind of grime is on them. I used some old pots for outdoor open fire cooking and I’m in the middle of using the baking soda peroxide paste on them and it seems to be working very well, even though it hasn’t set even a good 20 minutes. i let it sit over nite and used a steel scrubbie, the steel wool or SOS was too fine for this baked on grease. it worked pretty well. I have great luck with variations of this, and scrubbing is rarely required. They are all cheaper than Dawn Power Dissolver and work better for me. For most stains and stuck/burned on food, I just sprinkle on baking soda, cover with a wet paper towel, and return in 15 minutes to wipe it clean. For food that’s really burnt on, I make a slurry of baking soda, hydrogen peroxide, and liquid dish detergent. Washing soda is even stronger than baking soda, but it isn’t compatible with all surfaces (Don’t use it on aluminum). After applying the mixture, cover it with plastic wrap so it won’t dry out. That step is very important. Depending on the stain, leave it for a few minutes to overnight. The stain will wipe away easily (you may need to use a little pressure, but I’ve never really had to scrub). For very thick charred on stuff, you can repeat the process. Or you can start by boiling hydrogen peroxide and baking soda for 10 minutes (the heat is important), letting it sit for 15 minutes, and then gently scrubbing to reduce the crud. The same mix works on laundry stains (leave it on and keep it wet for a couple of hours). My family generates its fair share of tough stains, and this has been a miracle cleaner for me. I forgot to mention that I use the slurry of baking soda, hydrogen peroxide, and Dawn for the baked-on grime that accumulates on baking pans. I leave it on for 2 hours to overnight, making sure to keep it wet, and it works great. Step 2: While step one is sitting there. Put a pot of water to boil (fill pot 3/4 of the way), add 1/2 a cup of vinegar to water let boil. ***obviously a cookie sheet would need big enough pot. Step 3: Drop drip pan/burner with paste mix into boiling water. Let boil for 10-15 mins. Step 4: Take out of pot put into sink and scrub as usual. Steel wool is faster but a rough sponge works too. Gets rid of I’d say 90% of grime if really dirty. I use baking soda to clean my oven and it works amazing! I must say that it works better than the common oven cleaners! Regards! Crews Hill Carpet Cleaners Ltd. In recent days, I’ve discovered a magic miracle ingredient: cream of tartar. This stuff is amazing. So far, I’ve used it to remove rust stains, grease, and grime off me and my daughter’s drip pans. My daughter’s shower tile and tile baseboards. Her bathroom faucet taps. Everything was clean, bright, and shiny. I plan on using a 50/50 mixture of white vinegar and cream of tartar for the oven. Even if it doesn’t work out, I’m gonna include cream of tartar in my diy cleaning recipes. Has anyone tried Barkeeper’s Friend-It works fairly well on cookie sheets and great on stainless steel pots and pans …also works on stainless cutlery with rust or oxidation on them-they will look brand new! It usually will take rust stains out of clothing and dish rags, too. you can even use it on your stainless steel sinks and faucets. It’s amazing stuff! Apparently, the oxalic acid is the active reagent that makes Barkeeper’s Friend so much better than its competition. It also does a remarkable job at cleaning brass fixtures (like my doorknobs and mailbox cover). I first learned of it for cleaning black stains from wood, for which I am forever grateful, having returned my “destroyed” 50 year-old teak to mint condition. I use it now on the occasional black stains that arise on my woodblock counters. Just use a paste of water and BF, wait awhile and wipe clean. Great article! If we don`t have muscles what are our options? 🙂 You are so right that sometimes the one thing you need are muscles for cleaning. Greetings ! Baking soda is a great natural cleaner! I really like using it for cleaning! Thanks for the post!